The Bulgarian National Radio Children's Choir was founded in 1960. Since then they have earned a name as an ensemble with international reputation, having been guests in nearly thirty countries, and in cities such as New York, Washington, Tokyo, London, Paris, Berlin, Moscow, Vienna, Prague, Budapest, Brussels, Copenhagen, Stockholm, Helsinki, Mexico City, Honolulu, Cairo, etc. In Japan alone over the decades the choir has given nearly 500 concerts on 16 tours. They have won many international prizes and awards, and in 2002 the European Commission granted the title "Cultural Ambassador of Europe" to the Bulgarian National Radio Children's Choir. People living with disabilities can attend our concerts for a flat price of 800 Ft. 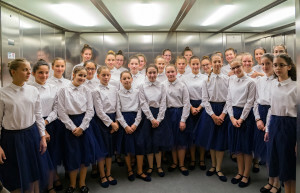 The Bulgarian National Radio Children’s Choir received assistance for transport from the Bulgarian National Cultural Fund, as part of the Mobilitas Programme.